The eight freshmen who enrolled this week is believed to be the most UW has ever had arrive on campus this early. 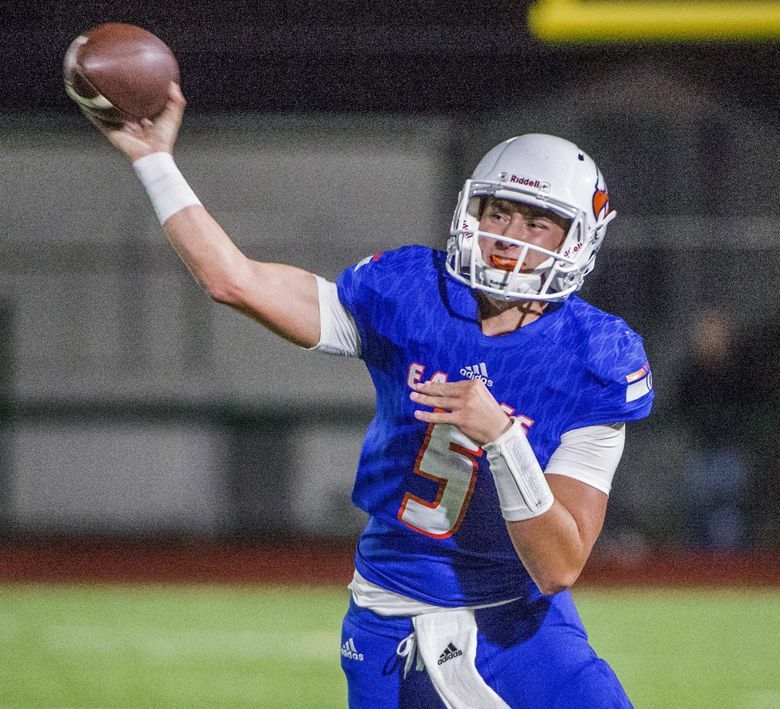 Eight freshmen, including quarterback Dylan Morris, who signed with the Washington Huskies during the early signing period last month have enrolled in winter-term classes at UW this week. The concept of incoming freshmen graduating high school early is a growing trend around college football, as freshmen try to get acclimated to college life and the demands of playing football. Four years ago, QB Jake Browning arrived at UW in January to begin winter-term classes, the only freshmen from the Huskies’ 2015 class to enroll early. By August, Browning had won the starting QB job. The eight freshmen who enrolled this week is believed to be the most UW has ever had arrive on campus this early. The eight are (listed from left on picture below): safety Cameron Williams; defensive lineman Jacob Bandes; offensive lineman Troy Fautanu; linebacker Joshua Calvert; linebacker Miki Ah You; offensive lineman Corey Luciano; QB Dylan Morris; and offensive lineman Julius Buelow. Chris Petersen said last month that a few other freshmen — including mammoth defensive tackle Sama Paama — could enroll for the start of spring-term classes on April 1. The Huskies finished No. 13 in the final AP Top 25 poll for 2018. Despite graduating the most productive backfield in program history, and perhaps losing as many as 10 defensive starters from their Pac-12-championship team, the Huskies are projected to open 2019 as a top-15 team. It says a lot about the job Chris Petersen has done that Washington’s 10 wins and Pac-12 title in 2018 felt like a disappointment. Turning the page to 2019, Washington loses two of the best players in program history: quarterback Jake Browning and running back Myles Gaskin. At quarterback, UW has an excellent replacement in Jacob Eason. … The defense, however, will replace a slew of all-conference players, including All-American linebacker Ben Burr-Kirven. Washington won at least 10 games and played in a New Year’s Six bowl for the third straight season. It also won a Pac-12 title for the second time in three seasons. But coach Chris Petersen is going to have yeoman’s work heading into 2019.